Chuck Monjak was partway up his first-ever attempt at a nearly vertical ice formation when he found himself in a terrifying predicament. With his weight supported only by the tips of his crampons, he had to figure out how to get around a bulging column of ice. "It's both an adrenaline rush and it's a puzzle-solving test. A lot of engineers, technical people get into this because of the problem-solving abilities necessary to do vertical ice," said Monjak, an optical systems engineer for a semiconductor firm. 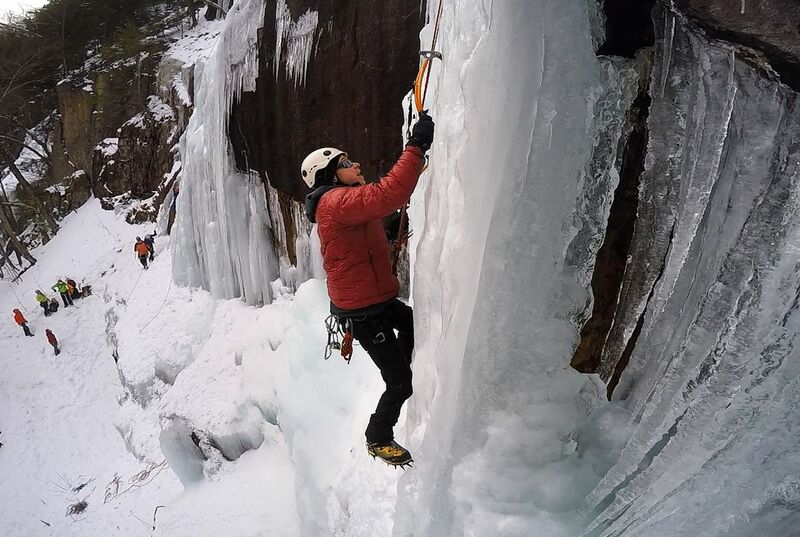 Dracula, a 100-foot ice fall, is one of the most challenging of the more than two dozen ice climbing routes that attract thrill-seekers to New Hampshire's Crawford Notch State Park each winter. Frankenstein Cliff was not named for the monster story, but for a 19th-century German landscape painter who was attracted to the beauty of the cliffs. Groundwater seeping out of the granite freezes each winter to create extraordinary icefalls. Climbing such ice structures is thrilling - and dangerous. Earlier in February, an ice climber had to be rescued after falling 50 to 60 feet on Cannon Cliff in New Hampshire. In upstate New York, a woman survived a 70-foot spill at Kaaterskill Falls, and another climber tumbled nearly 40 feet at Platte Clove, both on the same day in January. On Dracula, Monjak trusted his life to a rope being belayed by his partner, Yuki Fujita, who has been climbing Frankenstein's ice for nearly 50 years. Fujita, 69, a retired nuclear engineer, climbed the route first. Elsewhere in the park is Arethusa Falls, where a 60-foot pitch attracts climbers. Climbing a frozen waterfall I would imagine would be very difficult because of the risk there is. It is only ice that is temporary frozen so its easier to break. Also the waterfalls ice isn't as smooth as a glacier or something. Thats why this would be so difficult. 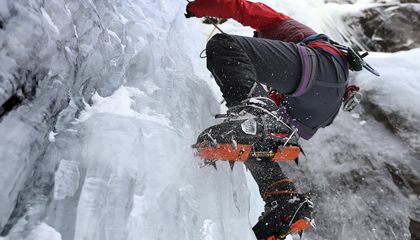 Climbing a frozen waterfall looks extremely challenging. It would be very hard to navigate the exact best way to position the body and choose your footing. I always feel it would be very easy to slip and fall from a great height by doing this. Someone that does this would need to acquire precise and relaxed climbing skills. Mainly because you don't want to mess up. Also it's very difficult to climb a frozen waterfall just like it's difficult to solve a puzzle. You have to know what you are doing when doing this dangerous stunt because one mistake can be very bad. You also have to take it step by step just like a puzzle. Also, you find out more and more the more you work on it. According to the article " Would You Climb A Frozen Waterfall" climbing a waterfall is like solving a puzzle. This is said because when you climb a frozen waterfall you have to use a lot of strategy and intelligence. I think this because when you climb a frozen waterfall you could fall easily without using knowledge. Now I know that when you climb a frozen waterfall it is very dangerous. Because with one wrong step the ice can easily break. Climbing a frozen waterfall is like solving a puzzle due to the fact where you pick to go up from. You need to have the right spot to go up, because if you don't the frozen waterfall may break and you may die.